Water bursts through the dome and floods the staircase. 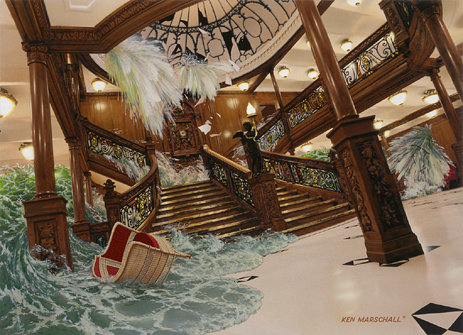 At around 2:15am, the elegant First Class Grand Staircase succumbs to the sea. Not only is water quickly rising up the stairs from the decks below, but also water bursts through the glass dome from above. The dome was located atop of the First Class Entrance deck house on the boat deck. The dome was surrounded by an enclosure with a skylight. Staircase Dome Enclosure with Skylight. It was around this point during the sinking that the water would have submerged the skylight, forcing it's way into the ship through the skylight and the dome. As a result of this incident, the staircase being made of oak, began to float and break away from it's fastenings. It is worth noting that the staircase that was created for James Cameron's film "Titanic", was almost a perfect replica of the original. When the movie set was purposely flooded, the staircase became dislodged unexpectedly. This supports the theory that the staircase may have actually floated completely out of the ship during the sinking.